The proposal I'm putting forward is a simple one--consolidate the 17 and 33 into a single new route, eliminating the current Market East jog both take in favor of connections offered to the Market Street buses at Market and JFK. This route would run service at a 15-minute headway and would be, like the 2, 7, 23, 47, 57, and C buses (and Broad Street Line and Philadelphia2050's proposed Loop Network) part of a frequent service core in the, er, urban core. Consolidating this service would still allow for connections to other core frequent services at Cecil B. Moore (3), Girard (15), Spring Garden (43), Market/JFK (10, 11, 13, 34, 36, and the MFL), Chestnut/Walnut (21, 42), and Lombard/South (40)--as well as possible frequent service route modifications along Race/Arch (31, 48) and Spruce/Pine (12, 30), and expanded light rail service along Girard (37 proposal) and Washington (49, 64) (see here). The bus sections of this proposal can be implemented with relatively minimal cost: putting out a new schedule and map, and putting up new bus station signs; the buses (and drivers) taken off the now-defunct 33 would go to augment some of the more poorly bused routes in this network (mostly east-west). Sometime in the near future I'm thinking of showing a map of this (unwieldy-named) Core Frequent Bus Network and connections, in the contexts of both current, and suggested Philadelphia2050, operations. A lot of people, me included, grew up browsing the local library, Borders, and Barnes & Noble, picking something off the shelf that looked interesting, and learning about topics as disparate as high literature, philosophy, and cosmology. More so than any other bookstore, Borders was a place where you could just plop down and read and sometimes even doze. While that might have been a problem, in terms of business-model sustainability, it certainly made Borders feel like the center of a community--a private but publicly available information repository. I grew up with Borders. My mom worked next to one, so whenever I had to wait for her I waited there. Whenever I found myself having to wait in Center City, I waited at the Borders at Broad and Chestnut. Most of the books I bought, I bought from Borders. They were always my favorite bookstore--the first one opening up in my area had been a revelation. I've never really felt at home in Barnes & Noble's stacks; I'll miss Borders. So what's next? A big push by Books-A-Million? The company is far too small to compete with B&N--and even then B&N hasn't been having a good year? What about Amazon deciding to maintain a physical presence alongside a Web presence? (Its market is the descendant of mail-order, after all, and it would be following in the footsteps of brands such as Sears and Montgomery Ward.) American expansion by the Canadian chains Indigo and Chapters? (Kobo, because of Borders, certainly has some American presence.) Or of European and Oceanic firms, such as Waterstone's, W.H. Smith, fnac, Weltbild, Angus & Robertson, or some other established chain? Or a contraction of the publication industry in general? (I hope it's not that, I want people to read.) But there's the rub--despite the doom-and-gloom claims that Borders went bankrupt because its core business model wasn't sustainable (especially in wake of Amazon), the fact that so many other companies are successful in their fields, coupled with bad business decisions Borders made (most especially its early-2000s partnership with Amazon, which really served to poach Borders' customers), and the destabilizing effect of the recession, was more what brought the store down. The need to browse is human, and these big chain bookstores are consequently always stuffed with browsers. Browsing leads to impulse purchases: this creates a market bricks-and-mortar retailers can capitalize on that mail-order catalogs Internet retailers can't. This is why firms such as Sears and Ward's made the leap from the catalog to the showroom and physical store--and why the physical store will never die: because the psychology of the shopper changes subtly from the catalog (or website) to the physical store: the site feels more like a wish list ("what if?") while the store feels more concrete, more there, and easier to think about getting. Impulse purchases on Amazon are unlikely; at Barnes & Noble, they're a certainty. A common criticism of zoning is its often-asinine parking requirements. Why, for example, should every new rowhome on an urban block have to have space for a vehicle--which in practice always means a garage? This emotional question is one which commonly initiates zoning reforms--yet, by the end of the process, community input from organizations who are continually worried about their neighborhoods' parking conditions--how hard it is to find a spot--will always ask for the re-inclusion of those exact same parking requirements, thereby frustrating the goals of transit activists, conservationists, New Urbanist planners, and others trying to shift the transportation mode share away from cars and more towards more sustainable modes, such as walking, biking, and mass transit. To that end, the bonusing system of highest-density zones in many cities involves cutting parking requirements when alternative transportation access is included. This often comes in the forms of bike parking and/or access to local mass transit stations and concourses. In initial rezoning, these bonuses are structured such that they can potentially eliminate parking requirements altogether; yet after the community review process they come out so mangled they barely reduce parking, and hence promote alternative mode shares, at all. Cap'n Transit today suggests a new approach: creation of zoning mirrors that either (a) eliminate parking or (b) promotes transit, by requiring a direct contribution to the local mass transit agency of roughly the amount it costs to add a garage. The full set of mirrors he suggests increases the number of possible zones, however, which would undermine another goal of zoning reform--reducing the number, and complexity, of zones to make the system more legible to both developers and community organizations. When the use of mirrors is seen in light of this counter-demand, however, a new idea comes to mind: why not just rethink what we mean by parking requirements? For the provisioning of parking requirements is nothing more--and nothing less--than a policy meant to ensure transportation access to and from the site by the resident, patron, employee, whatever. It is thus intended to ensure economic access through the means of zoning. But the high autocentrism of the language--the way the requirements have been warped, either accidentally or deliberately--undercuts the aspiration behind providing this requirement in the first place. Parking requirements--instead of transportation access requirements--are an ossified remnant of the grand 1950s ideal that driving would be truly liberating. The simpler way to offer what Cap'n Transit is suggesting is, thus, to simply offer a menu of different classes of transportation access instead of simply requiring parking. A developer could offer (a) parking to every unit or (b) a bike parking facility or (c) insurance of transit access via a grant to the local mass transportation agency to ensure a continuance of service, of roughly the per-unit cost of a garage or carport, or (d) a mix-and-match of the above options. Any options, by themselves, would be by right; mixing and matching would trigger a minor variance (to ensure that the percentages being allotted to each mode is in line with city mode-share desires). Transportation access requirements would then be built on the framework parking minimums offer, while superseding the detrimental effects, when scaled, those minimums create. It is also far simple to insert, and interpret, a transportation access table with different expectations and requirements pertaining to access of each mode at the beginning (or end) of the code, than it is to overstuff the code with reams of variant zones whose only purpose is to delineate different classes of transportation access. So, since the Democrats dawdled their way out of a supermajority that could have easily allowed them to pass a good urban-oriented national transportation bill, the now Republican-controlled House has (finally!) produced a new national transportation bill*. This bill controls Federal expenditure on transportation for the amount of time it takes until the bill expires; historically it's been treated as a sort of Five-Year Plan for the Interstates. While others have done a better job pointing out the bill's many obvious shortcomings, I'd like to focus on how we need to reorient and refocus our transportation bill. Since Mica's orientation paradigm is entirely reactionary--stripping out all of the most important features the bill has and retaining precisely what needs to be stripped out--understanding this new orientation is absolutely necessary, especially in terms of a public transportation policy shifting along with the changing transportation demands of the public. What is happening is the beginning of a generational modal shift away from cars to walking, bikes, and mass transit. This shift is currently happening as a choice, as recent college graduates, more aware than ever of problems with the status quo, deliberately eschew the freedoms offered by the automobile (the ability to go anywhere, anytime) in favor of the freedoms offered by other modes (the ability to do your work, or snooze, or read while commuting). Hence, since the popular zeitgeist is a refutation of autocentrism, it should be expected public policy is shaped by it. Mica's policy is reactionary in that it follows a caricature of 1950s transportation policy--namely, the stereotype of the era as being highway-centric--and thus seems like an attempt to force perception to bend to the will of policy, rather than the other way around. Instead, passage of this bill would just further pen up demand for alternative, walkable, urban, urbane places and lifestyles. It would grossly subsidize status quo exurban construction, even as demand for those types of places collapsed in the wake of the Great Recession--and not subsidize enough to artificially create any demand, either. In other words, it would be a boondoggle on a truly colossal scale, a scale at the same level as the 1950s' urban renewal. And unlike the 1950s, we don't have the liquidity to invest poorly anymore. We need to force a high ROI out of any investment we make...in making this claim, the conservatives are ideologically correct, regardless of how when it plays out in practice, conservatives seem attracted, like mosquitoes, to projects with the lowest public ROI (but the highest subsidies, visible or otherwise, for corporatist interests). Providing planning and implementation monies to ensure transportation security at the national, state, and metropolitan levels. Ensuring that monies disbursed from aforesaid infrastructure bank are equitably divided between (a) national-level freight and passenger rail, (b) state-level freight and passenger rail, and (c) mass transit for interconnecting cities and urbanizing suburbs. This is the broad framework the bill needs to operate in. Notice how diametrically different this framework is from the current framework, which focuses on highways and strips away all other funding--blindingly stupid when highways currently have the lowest ROI of any public infrastructure investment. Since we are overcapitalized on highway investment, with a handful of exceptions, and undercapitalized on rail investment, with almost no exception, eliminating excess capital from the highway network and plowing it into rail--as the only network able to operate with the same efficiency as highways--makes eminent sense. 1. Decreased overall road spending. Road spending focus on repair. Sale or leasing of limited-access highways (primarily Interstates) to private transportation providers to provide capital for funding most of the rest of the bill, primarily through national- and state-level infrastructure banks. 2. Massively increased rail spending. Freight rail mainline electrification mandate; passenger rail mandate to provide daily service to all cities of 50,000 people or more; high-speed rail mandate to provide high-speed service to all metropolitan areas of 500,000 people or more, with 600 overland miles or less to the nearest similarly-sized metropolitan area. Reform of FRA and FTA to meet European and Japanese standards. Elimination of Buy America on small orders. Tax breaks for domestic railroad equipment manufacture and for shipping by rail. 3. Massively increased mass transportation spending. Mandates to provide transit access to 80% of all addresses in metropolitan areas and potential capacity enough to move half of the metropolitan area's population; mandate to provide a comprehensive implementation plan to that effect by the end of the decade. Increase of Small Starts and New Starts funding; enaction of America Fast Forward proposals. 4. Provision for planning of port and maritime facilities on a national scale. Ensurance that all large metropolitan areas (500,000+) with maritime access has national-level port. Planning and implementation of Maritime Interstates, following the coastlines, Great Lakes, and major navigable rivers. 5. Monies to maintain airports. Effort to reduce short- and medium-haul flights to increase long-haul capacity. Make airports profitable, and do not publicly fund profitable ones. Privatize airports in the same manner as the Interstates. 6. Pedestrians, bicyclists, and streets (as opposed to roads). Maintain a complete streets/shared space policy. Provide sidewalk access on all streets that are not to be shared space. Provide separate bicycle access parallel to arterial traffic roads, usually via a complete street. Finally, create national-, state-, and metropolitan-level "bicycle highway" multi-use trails, to be funded in cooperation between transportation and parks departments. 7. The infrastructure bank. Privatization of limited-access highways (primarily Interstates) and airports offers an excellent opportunity to fund an infrastructure bank. Land value of these holdings is in the many hundreds of billions, and transportation value in the trillions. Getting fair value for these holdings consequently offers enough liquidity to fund new public infrastructure projects for a decade or more. By providing infrastructure banks at the Federal and state levels, this liquidity is managed, and with a strong vetting infrastructure, poured into projects offering the biggest bang for the buck. No transportation bill option currently on the table offers the value, stability, liquidity, and security of an infrastructure bank system financed via the privatization of currently-public infrastructure. Roads: Leasing or sale of Interstate or Interstate-grade highways (privatization) will enable user fees to be bought to bear on an overutilized socialist commons; as a mature technology, the time is ripe to undertake this endeavor. Public road maintenance will be funded through the infrastructure bank. Roads will be maintained according to how much access they offer; rural (primarily access) roads will be funded at an appropriate level, as will urban roads. Since funding transportation also entails eliminating overcapacity, funds will also be disbursed for the elimination of excessive roadway capacity implemented two or three generations ago (i.e. removal of urban freeways) in favor of the higher ROI generated via land development. Preferentially fund roadway projects which (a) do not increase capacity (that is: repairs first) and (b) have strong state and local financial support. No project with less than 25% state financial support and 10% local financial support should be Federally funded (in essence, this caps Federal funding at 65%). Rail: Current funding for Amtrak would stay intact. Future funding for Amtrak improvements would be folded into the infrastructure bank. High-speed network proposals and funding would be folded into the infrastructure bank. A new mandate for electrification of all freight mainlines by 2040. National standard would be 25kV 50 Hz catenary able to handle double-stack container trains. Funding for this mandate would be accomplished through infrastructure bank disbursals to freight line owners. Special committee for the total rewriting of FRA and FTA regulation to make them internationally-compliant. Repeal of Buy America for smaller orders (sub-100 units) balanced with a rail manufacture-and-utilization tax break to better balance transportation modal shares and promote a domestic rail manufacturing industry. Mandate daily passenger rail to all cities with a population greater than 50,000 and high-speed rail between all metropolitan areas with a population greater than 500,000, 600 overland miles or less from the nearest equivalent population center, both by 2050. Passenger rail is an Amtrak mandate, funded through the infrastructure bank, while HSR would likely utilize PPPs. Note also that the HSR mandate just applies to linking individual cities into a network. Note also that 600 miles is just a tad longer than optimal corridor viability, but connects nearly every middle-to-large city in the U.S. to one another via multiple transportation modes. Assume that HSR will utilize new rights-of-way while slower-speed trains will utilize existing rights-of-way outside of urban centers. Mass Transit: Match Federal and state funding for all mass transit systems, nationwide. Establish and fund planning-and-implementation programs for mass transit systems to eliminate gaps and optimize service, nationwide. Different local mandates will of course create different conditions, but when oil is expensive the need for greater mass transit service will be more pressing. All metros of 500,000+ must be capable of reaching 80% and moving 50% of their population via mass transit by 2060. Plans to reach this mandate must be complete by 2020. Implement funding strategies as suggested in America Fast Forward (L.A. 30/10). Tie reception of all federal urban development monies (for 500,000+ cities) to the successful planning and implementation of mass transit. Mass transit is the key competitive advantage of the 21st century; cities which understand this are those best poised for long-term growth. Cities which choose not to implement mass transit are thus those least able to maximize returns on Federal investment. Increase New Starts and Small Starts funding by at least 100%. Fund projects with maximal people-movement potential first, maximal non-people-movement-based environmental impact potential second, and maximal developmental potential third. Vet and penalize projects with inefficient expenditures (for example, overdesigned stations relative to service levels, overpriced equipment, new equipment when used equipment can suffice) and projects with low returns on investment viz. station-side development (reward TODs and penalize the overuse of park-and-rides). Preferentially fund projects with strong state and local financial support. Provide Federal matching monies to rail agencies which sell, lease, or develop upon excessive park-and-ride capacity. Maritime: Establish a ports policy at a national level. Port capacity should be greatest where port needs are greatest. Plan and implement a policy of national-level alpha, beta, and gamma ports, and fund repairs and improvements at those ports in kind. Plan and implement a network of maritime Interstates following major waterways. Interstate maritime traffic is relatively underrepresented in the United States, and much more freight can, and should, be moved along the coasts and Gulf, on the Great Lakes, and down the major navigable river systems (Mississippi, Columbia, Hudson, etc.) than current levels. Traffic along these maritime routes would run between ports of four classifications: alpha, beta, gamma, and delta (non-nationally-important ports, particularly along the rivers). Most of the physical infrastructure for this network is already built-out; repair and expand were needed, and promote maritime freight operations with a minor tax break. Ensure that all large metropolitan areas (500,000+) with maritime access (along a coast or navigable river) have access to a national-level port. Airports: Maintain funding for airport repair. Work to shift short- and medium-length trips from the air network into other modes in order to free up greater long-haul capacity without physical airport expansion. Work to make airport facilities independently profitable for sale or lease (à la the Interstates). Pedestrians/Bicyclists/Streets: Fund and improve pedestrian links. Mandate that all non-local road projects have pedestrian infrastructure. This would be absorbed into larger-scale road funding. Plan and implement national-, state-, and metropolitan-level bike highways (multi-use trails). Funding for this network would come from a combination of DOT and Parks Department monies. Prioritize funding for complete streets and shared spaces projects. Infrastructure Bank: The financing centerpiece of this policy is the establishment of a Federal-level and state-level infrastructure bank. This bank will be initially funded by the sale or lease of limited-access divided highways, Interstates and otherwise, as well as the sale or lease of airports. Money from this sale (land value of these properties is likely in excess of $500 billion, and transportation value greater still) will be divided 60-40 between Federal-level and state-level infrastructure banks. The infrastructure bank will assess, vet, and disburse for projects which maximizes ROI in the following areas: (1) maximal transportation access, across all modes; (2) increased land values and human-scale development patterns nearest transportation access nodes; (3) has high degree of patronization (for rail projects, for example, 100 persons per mile or above); and (4) is economically efficient (a commuter rail example: it uses existing equipment wherever possible, has station engineering in line with ridership projections, places stations in established centers preferentially or else has a land-use plan in place to develop a town center around the station, uses park-and-rides only sparingly, and in places where park-and-ride patronage will be highest, etc.) Highest-impact projects are those with relatively minimized costs, calculated in metrics appropriate to mode, and maximized returns on cost, in terms of the triple bottom line. The national infrastructure bank will contribute between 50% and 65% to public projects, and the state infrastructure bank between 25% and 35%. Remainders--usually in the 10% to 15% range--are to be contributed via local and/or private matching funds. * Yes, I'm deliberately shying away from calling it a "highway bill" for reasons explained further along in the post. Nearly every American zoning code takes minimum parking requirements for granted: every habitable structure has to have a minimum of so-and-so parking per unit (if residential) or square feet (if commercial or industrial). Yet this practice runs counter to international best practices. European cities, for example, are purposefully making themselves car-hostile. And changing thoughts on parking requirements are creating a patchwork in which some cities have parking minima and others parking maxima. The major problem is that since 1950 American cities have seen auto access as a given; rather, its proper place is a luxury. Streets need to be there for service vehicles, but they don't need nearly as much space as they claim. (Japan, for example, proves that.) Automobiles are merely one mode out of many of transportation access--their usage is enforced when we create environments where there is no mass transit and other modes of personal transit (pedestrian, bike) are well-nigh suicidal, but their usage is also encouraged when we overbuild automotive infrastructure where there is great access via all other modes as well. European cities understand this. The idea of building an apartment building next to light rail, to take an example from the Times article, is reasonably urban (indeed, that is the root of transportation-oriented development), but by giving such a structure a massive parking deck for residents, you abrogate the development opportunities gained by being transit-oriented and instead merely make it transit-proximate. In an era where resources need to be shifted to better use less energy, providing a parking space per unit just doesn't make any sense. TOD planning has helped bring about change--see places like Rosslyn, VA--but the reality is that with fewer resources we can put toward transportation better transportation planning is necessary. TOD is only an element in broader planning--and Philadelphia, and every city, for that matter, needs to start planning to ensure that every citizen has adequate transportation access to every mode, and an environment conducive to less energy-intensive modes of transportation and more gung-ho about more energy-intensive modes. In other words, the way we zone needs to make it easier to walk, ride a bike, or take the bus or train than drive. To that end, along with the development and implementation of a 50-year transportation plan, such as Philadelphia2050, every metropolitan area in the U.S. needs to reconsider how it accommodates automobiles, through both roadway design and construction and planned transit access and network design--and through parking requirements. Parking minima should only be enacted in places where mass transit access in a 50-year timeframe is simply not a viable option, and zoning massing densities* complemented with a gradation of parking maxima relative to density, with the highest-density and closest-to-high-capacity-transit locales having no parking requirements whatsoever. ** Ideally, this would be bundled with market-rate pricing of parking throughout the urban organism, such as what Market Urbanism suggests, and the complete-street/shared-space network I have previously described--a one-two punch that would effectively eliminate several hidden subsidies for cars in the urban cores and provide a long-term ridership base for mass transit and regional bike trails. * In either Euclidean or form-based frameworks. ** Philadelphia's new zoning code would have been trailblazing in enacting something not much different from this, but Center City neighborhood associations--particularly the perennial thorn-in-the-side LSNA--succeeded in having such progressive language removed from the bill, due to parking concerns. The idea that parking would be removed by removing cars from the road never seems to have been considered. This is the second in a three-part series on improving transit in the southern part of the Northeast. The first focused on the Washington Metro, and the third will focus on mass transit in Baltimore. 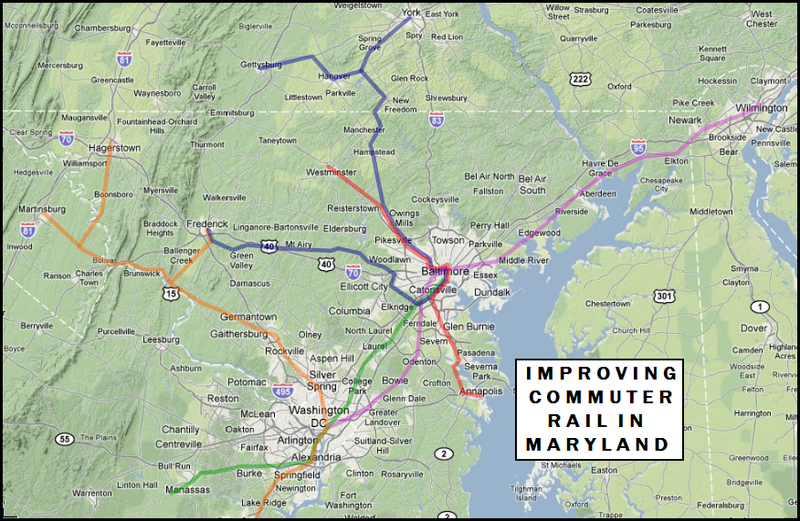 MARC is Maryland's commuter rail system. It certainly does its job, with three lines emanating from Union Station, and three lines emanating from downtown Baltimore. 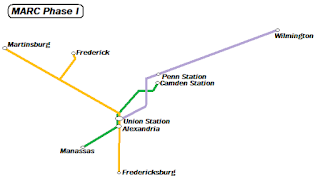 The Penn Line runs from Perryville via Baltimore Penn Station to Union Station; the Camden Line from Camden Station in downtown Baltimore to Union Station; and the Brunswick Line from Martinsburg, WV, to Union Station. Along with the two VRE lines from Union Station to (a) Fredericksburg and (b) Manassas, MARC offers adequate commuter rail for the D.C. area. In concert with the Metro, this means the D.C. metropolitan area has the third-best transit infrastructure in the Northeast, and fourth-best in the nation, after New York, Chicago, and Boston. MARC could, however, be better. 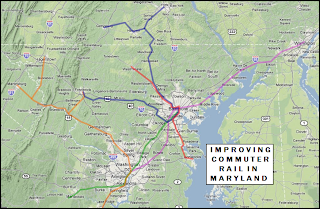 Its charter doesn't just call for D.C.-area commuter rail, it calls for commuter rail for all of Maryland. 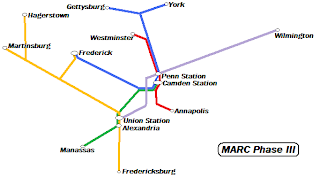 Its Baltimore lines are relatively poor, concentrating along the Royal Blue/Northeast Corridor axes rather than branching out throughout the metropolitan area, and it lacks service to either Maryland's state capital, Annapolis, or its sixth largest city, Hagerstown, despite reaching all the way to Martinsburg. MARC's paucity of lines, relative to potential (VRE has two lines, but all of the historic lines heading from D.C. into Virginia are accounted for between it and the Metro's Orange Line) makes it the Northeast's worst commuter rail system in terms of service scope. My improvements to MARC go well beyond just extending the Penn Line to Wilmington to interconnect with SEPTA. To offer excellent rail transit options at a commuter and low-level intercity capacity, the proposal is to merge MARC and VRE and to transform the system into a double-S-Bahn-type network, with an S-Bahn set emanating from Baltimore and a second from D.C. The current MARC network, when combined with VRE, produces a three-line double-S-Bahn network (Penn Line, Cumberland-Fredericksburg Line, Camden-Manassas Line), but only one of these three lines has a Baltimore nexus. Line additions thus concentrate on Baltimore. 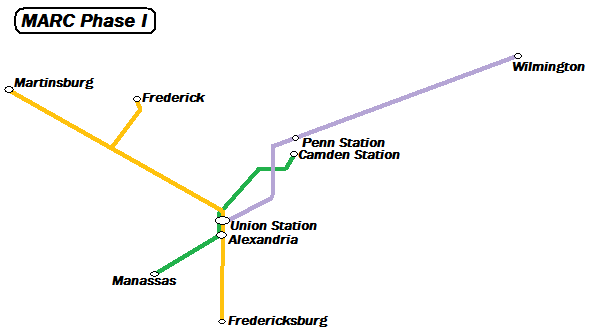 Two new lines are proposed, extending from Gettysburg, PA via Baltimore to Frederick, with a branch to York, PA, and one from Westminster to Annapolis. Additionally, a branch of the Cumberland Line from Duffields (WV) to Hagerstown (MD) is proposed. The plan of action for this new system would be to activate the lines into the city center first. These would take the form of two new lines terminating at Camden Station (one to Annapolis, and the other Frederick), and two at Penn Station (one to Westminster, and the other Gettysburg/York), constituting Phase II. Finally, once the lines are all in use, the interconnection between Camden Station and Penn Station will be built, linking the two sections of the Gettysburg-Frederick and Westminster-Annapolis lines together. The line names are interesting. After thinking about it a bit, I decided to go with a 3-letter initialism, such that each line has the north origination first, the via city second, and the southern terminus last. Thus the Penn Line becomes WBW, or Wilmington via Baltimore to Washington, and the Cumberland-Fredericksburg Line becomes MWF, or Morgantown via Washington to Fredericksburg. This system is elegant and seems easy to apply to other networks, too. MARC, improved. Five lines offer service throughout the Baltimore and Washington metropolitan areas. A couple of interesting features are present in this system. First, because Martinsburg and Hagerstown are opposite poles of a micropolitan area, a shuttle train between the two would be immediately suggested; this shuttle, due to the nature of the system just outlined, would have a fare union with the broader network. Secondly, this network passes several Civil War sites (both Bull Runs, Fredericksburg, Gettysburg, Antietam), which effectively makes this system a Civil War railroad and thus able to provide excursions for reenactors, history buffs, school trips, Scouting trips, etc. Excursions, by their nature, are not scheduled trips; however, the equipment needed to run this system normally makes providing them a worthwhile promotion--a good loss-leader, if you will. And finally, this network suggests further extensions, including one to Harrisburg, another from Westminster to Hagerstown, and a third from Martinsburg to Cumberland. MARC is an average system, by American standards. Let's make it better.